Young Asian worker talking to female team leader. Happy mixed ethnicity millennial colleagues enjoy healthy office atmosphere 4K. Woman boss listening and helping employee manage work difficulties. Beautiful female executive helps Asian colleague at his table. Multiethnic business people work in modern office 4K. European businesswoman motivates young Japanese employee, explaining the job. Happy businesswoman shows info on tablet to Japanese young colleague. Multiethnic people work in modern light office 4K. Attractive confident female team leader helping colleague make progress. Camera zooms in on Caucasian female executive talking to young Asian employee. Diverse business people private discussion in loft office 4K. Professional freelance worker takes job interview talk. Handsome Asian freelancer talking to female business coach. 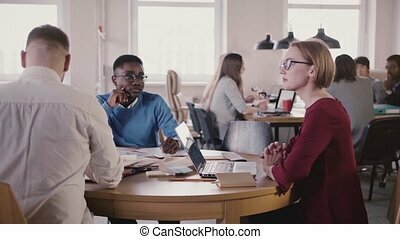 Multiethnic people discussion in stylish modern office 4K. Friendly lawyer woman gives advice and counselling to millennial Japanese man. Female boss gives instructions to Asian man. 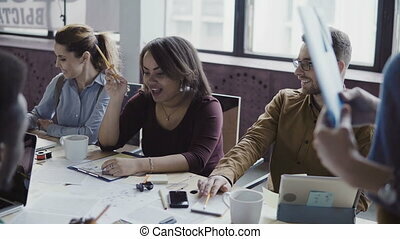 Multiethnic happy colleagues work in casual modern loft office, panning right 4K. European businesswoman motivates young employee, explains new tasks. 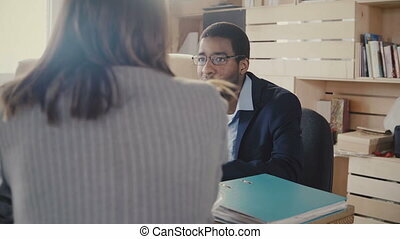 Young Asian man talking to attractive HR woman at job interview. Diverse business people cooperate in modern office 4K. Friendly female executive talks to freelance employee in loft coworking. Happy multiethnic business people meeting in office. Female manager gives documents to employees at trendy workplace 4K. Young millennial start-up partners collaborate on new partnership agreement. Attractive female company CEO talking to young male Asian colleague. Confident businesswoman motivates and empowers employee in loft modern office 4K. Japanese freelance worker meeting team executive. Mixed ethnicity colleagues talk in loft coworking. 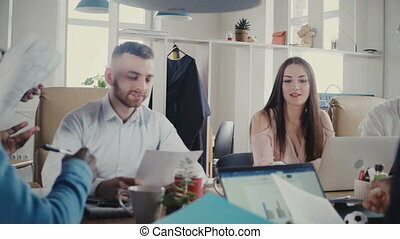 Young happy friendly workers enjoy healthy office atmosphere 4K. 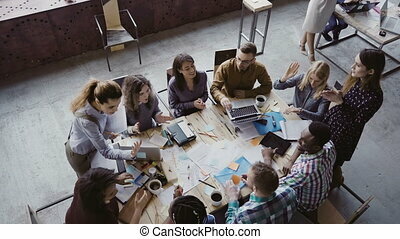 Diverse millennial business people stand and chat discussing new achievement. 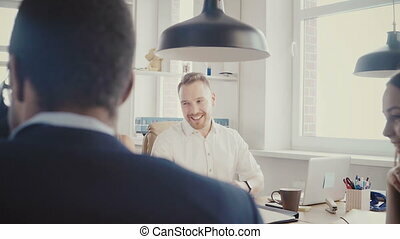 Happy female leader helps young Japanese colleague, they discuss work process and collaborate in modern trendy multiethnic loft office slow motion. Teamwork and cooperation at healthy workplace. Camera follows female leader enter office, then chat with colleagues. Happy multiethnic confident business people friendly discussion 4K. Casual young diverse employees work in modern light office. 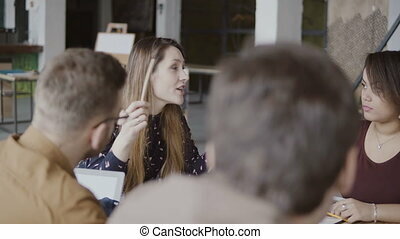 Young successful female CEO businesswoman listening to male employee, discussing work process in modern healthy office. Millennial happy business people cooperate at trendy loft coworking space. Female blonde manager comes to creative business team. Mixed race group of people meeting in modern office. Woman team leader talking with colleagues. Camera moves up from female legs. Young female manager giving direction to her team. 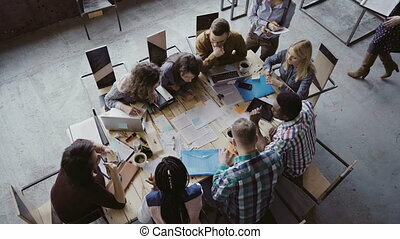 Multiethnic group of people at morning planning in loft office. Young and perspective start-up company. Mixed race group of young people working, listening the business training at loft office. 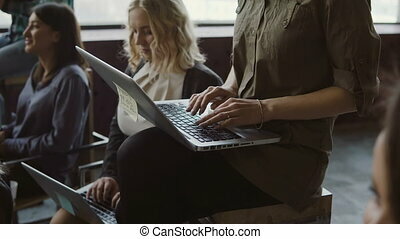 Successful women typing at laptop. Lecture hall with creative students team. Mixed race group of people sitting at the table at loft office and talking. African woman tells to colleagues and laughs. Young creative business team working together at modern co-working space. Top view of creative business team sitting at the table at loft office and working. 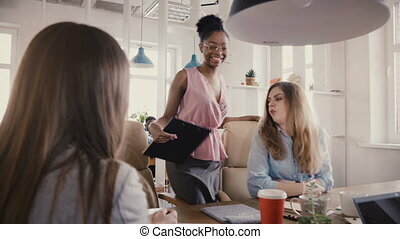 Woman manager brings the document to mixed race group of people. Colleagues discussing the project. Business meeting at modern trendy office. Young multiethnic team listen the seminar. Student makes the notes at laptop and notebook. Group of happy people at loft coworking space. Top view of creative business team working at loft modern office. Colleagues talking, smiling, high five with each other. Happy young start-up project, brainstorming in boardroom. Two colleagues meeting at modern office to discussing plans. 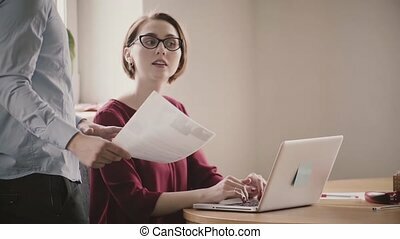 African businessman and caucasian businesswoman look the documents. 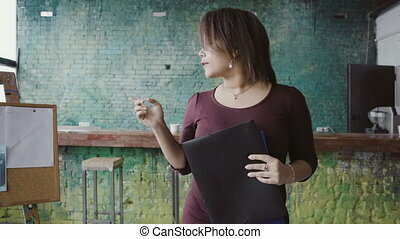 Attractive manager talking with team leader near the bar counter.